STYLE SPOTLIGHT ON ERIN CHOW OF HAVEN TEXTILE COMPANY — A GOOD CHICK TO KNOW. With a creative background in interior design and years spent surrounded by beautiful treasures at our city’s top decor boutique, it’s no surprise that local designer Erin Chow found her passion creating stunning pieces for the home. 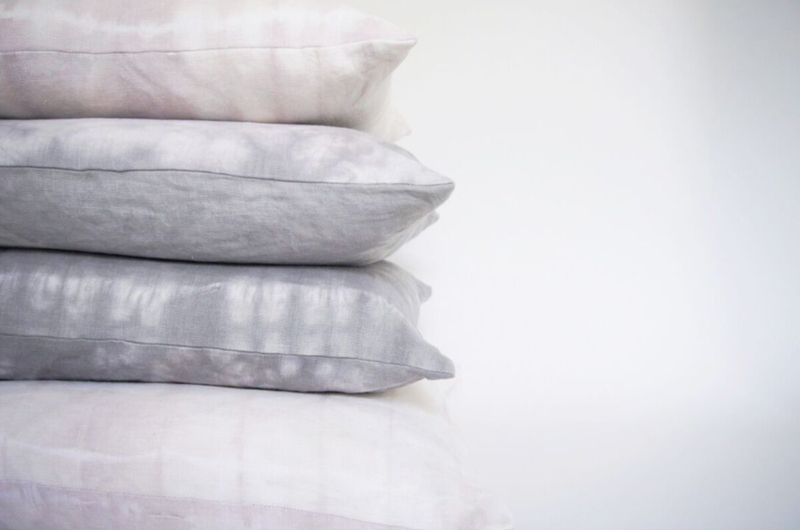 This week we check in with Chow on what inspired her to take the leap into starting her own textile brand, Haven Textile Company, and what she surrounds herself with to keep the creativity flowing. I was born and raised in Vancouver. I completed my education in Interior Design at BCIT and have been working at The Cross Decor and Design for 5 years. I developed an affinity for pattern and texture while working in the industry and found myself driven to create. My weekend dye experiments soon moved into a studio space in Railtown and Haven Textile Company was established. I am always striving to create beauty and balance in my life and I believe that travel feeds my soul. 2. How did you get started in textiles and what led you to where you are now? I was looking for a way to salvage a shirt that I had stained and found a DIY while surfing pinterest. I made an attempt at dyeing at was hooked. I started experimenting with different Shibori techniques and natural dyes and found myself completely taken with the process. I attended a few workshops through the Maiwa School of Textiles to further develop my skills and soon outgrew my tiny kitchen. I moved my work to Octopus Studios in Railtown and shortly after launched my line of hand dyed textiles focussing on one of a kind pieces for your home. 3. What colour best describes your personality? Grey, but not in a boring drab kind of way! Think cool, calm and serene. 4. What is your favourite accessory (for home or personal)? 5. When it comes to style/design, what is the one thing you covet the most? I have a beautiful carved skull that I picked up in Bali. It was the start of a 3 week long trip, and I lugged that thing everywhere. Everytime I look at it I'm reminded of my trip. 6. Do you have any predictions for the future of your industry? I see that people are really asking more questions about what they are purchasing: where was this made? how was this made? what kind of materials were used? I'm seeing a shift in people considering the global impacts of something they are purchasing for their home. 7. Some people collect old cameras & typewriters. Do you collect anything? I'm really not a stuff person, I like to keep my personal space very simple and clean. 8. Who is your idol or mentor? I'm a huge fan of Craig Stanghetta and the work of STE Marie. 9. What is your favourite creative website? 10. If you weren’t doing this, what would you be doing? I think I'd make a pretty good detective or maybe running some sort of Air Bnb in Mexico. 11. Is there a song or a musician that inspires you to create? Sade gets me in the zone. 12. If you could speak to a room of youth who were considering careers in the arts, what would your advice be? 13. Artistically, what is your favourite part of the city? I love the old charm of Gastown, but the eclectic-ness of Main Street.